Your vehicle has been approved in accordance with the latest ISOFIX regulation s .
The seats, represented below, are fitted with regulation ISOFIX mountings. There are three rings for each seat. - Two rings A , located between the vehicle seat back and cushion, indicated by a label. - A ring B , behind the seat, referred to as the TOP TETHER for fixing the upper strap. 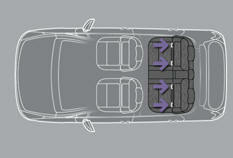 This ISOFIX mounting system provides fast, reliable and safe fitting of the child seat in your vehicle. The ISOFIX child seats are fitted with two latches which are easily secured on the two rings A . Some also have an upper strap which is attached to ring B . For information regarding the ISOFIX child seats which can be installed in your vehicle, refer to the table showing the locations for installing ISOFIX child seats.